Providing secure ground level storage units with 24/7 access for domestic and commercial customers. 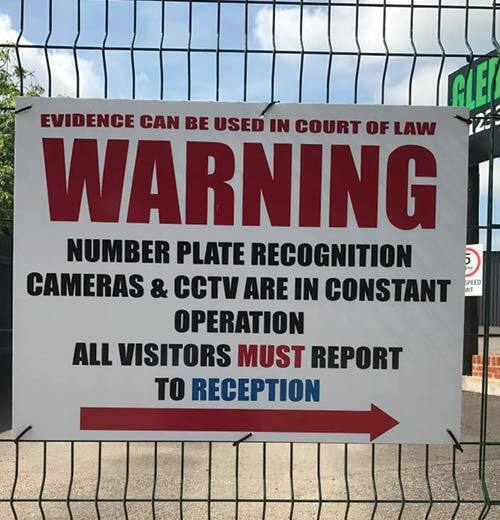 At Glebe Self Storage, we pride ourselves on our 24/7 security including electric gates, security fences and CCTV systems. For homeowners, market traders and businesses alike, your possessions will remain secure on our site. For builders and traders needing to access their stock and tools late at night, some of our self storage containers also have access to electrics. If you would like to learn more about our security solutions for your self storage container then call us today on 01233 732 990, by mobile on 07857 214546, or get in touch through our contact form. At Glebe Self Storage, our site is fully secured and council approved, with the necessary legal permissions for storage hire. We have a secure yard with 24-hour CCTV surveillance in place to ensure your items are protected round the clock. We also require our customers to supply their own padlocks and we provide you with a fob to enter our front gates – that way, no one has the key or combination but you. With electric gates and security fences, we ensure that intruders and unwanted persons are kept out of the site; only those who have containers and are able to enter will be allowed to. This keeps your property safe from vandalism and theft. Our self storage containers are also secured against the elements. Each is dry and weatherproof, meaning your possessions will be kept in optimum condition, whatever is happening outside. We have hardstanding, ground level access to our self storage containers, so you will be able to drive right up to them for easy loading and unloading. There is also a fork lift truck and pallet trolley on-site, meaning that heavy packaged goods can be transferred easily and safely to our containers. Electric gates operate 24-hours a day, every day, so you can access the site and your items whenever you need to. Containers are clearly numbered, which makes them easy to find at any time. To discover more about security and access at Glebe Self Storage in Kent, contact our professional and experienced team today by calling on 01233 732 990, by mobile on 07857 214546, or sending us a message through our contact page to discuss your self storage requirements. Many of our homeowners and commercial customers that make use of our self storage containers visit our site from areas such as Medway, Canterbury, Shepway, Tonbridge and Malling, Gravesham, Sevenoaks, Dartford, Thanet, Rye and Swale.